A NRHA Non Pro Futurity & Derby Champion, while riding and training her own horses, Sandy Bentien is the ultimate DIY-er. 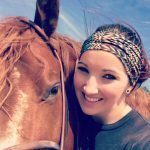 In this episode, she tells us how building a connection with your horse can give you an edge in the show pen, and how to balance your ambitions with the wellbeing of your horse. Learn more about Sandy and her horses on Facebook at Bentien Performance Horses, Make It With A Twist (Honey), and Gotta Twist It Up (Ace). Love what your doing and can’t wait to see where your business goes!! !